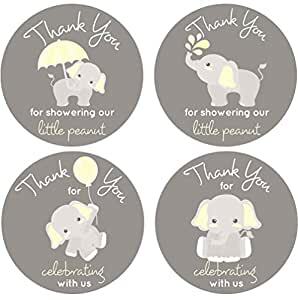 These cute elephant stickers will make your baby shower extra special! Just peel and stick! 2″ round labels are great for favors and thank yous. These have a glossy finish. This is for 60 stickers. You get all 4 designs. Loved these!! I got many compliments on my thank you cards. Guests thought I had mine professionally done with these stickers. I got it fast. Nice idea to use for any party especially if you donât have time to personalized everything.